George P Johnson picked up the Platinum Award at the Eventia Awards on friday night, which featured entertainment from X Factor's Johnny Robinson, who was a huge hit with the crowd. 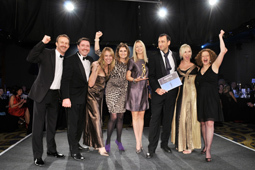 The awards, held at the Hilton Park Lane, attracted some 700 people from the events industry and was hosted by Alistair McGowan. Other notable winners of the evening included Smyle, which bagged the Gold Award for Agency of the Year, along with two Silver Awards and Two Bronze Awards for its work and Event Assured managing director Brian Kirsch, who picked up the Outstanding Achievement Award for his work as head of Eventia’s Regulation Committee. Prudential won In House Event Team of the Year, while TRO Group won the Gold for Creative Use of Technology, Best Experiential Event went to RPM Ltd and Jack Morton Worldwide picked up Gold for Best Product Launch.